You always keep your eyes on the prize. You’ve given yourself no other options and your steadfastness is your compass. What you believe will happen. What you know is truth. Say it enough, and everybody else will know, too – especially when, as in the new book The Sun Does Shine by Anthony Ray Hinton with Lara Love Hardin, the truth is one of innocence. On a night in the summer of 1985, 29-year-old Ray Hinton checked in with the security guard at his workplace, just as he’d been told to always do. He hadn’t been at the job long, but that had become his routine every night before getting assignments for his shift, doing work he liked. Reaching that point hadn’t been easy. The youngest of 10 children, Hinton was his mother’s “baby” and he continued to live with her after high school; though he’d thought about college, there was no money or scholarship for it. Instead, he found work at an Alabama coal mine, hating the work, loving the paycheck, still wanting what he couldn’t afford. He took a car he never paid for, and it cost him a few months in jail. By that evening in the summer of 1985, though, Hinton had resolved to make his Mama proud. He was again employed, sober, living on the straight-and-narrow, had checked in with the guard as he was told, and worked until it was time to go home. And that was where he was arrested five days later, accused of a robbery and murder committed while he was at work, miles from the crime scene. His trial was short. The jury was all-white, as were the judge, prosecutor, defense attorney, and a ballistics “expert” that was no expert. During the trial, Hinton “knew” he’d be convicted, knew it in his heart, even though he clearly had an alibi. He was innocent. And he was sent to Death Row. Because there’s a book about this, you’ve probably already figured out that author Anthony Ray Hardin is a free man now. You already know of his innocence. The shocker is that that took 30 years for exoneration, and when you read The Sun Does Shine (with Lara Love Hardin), be prepared to be shocked some more. Or maybe you won’t be: at times, Hardin himself seems to expect many of the things that happened to him, which leads to a whole host of emotions for a reader. You shouldn’t, in fact, be at all surprised to feel frustration, sadness, white-hot anger, and crushing despair – sometimes, from the same page. And yet, despite that you’ll cringe inside, Hardin also makes readers’ souls soar with words that reveal small beauties between horrors, and kindness where you don’t expect it. That’s like taking an amusement-park ride with no seat belts: hang on tight, because it might hurt. What’s left to say, then, about this book? Nothing, except that you’ll like it for everything it wrings from you. 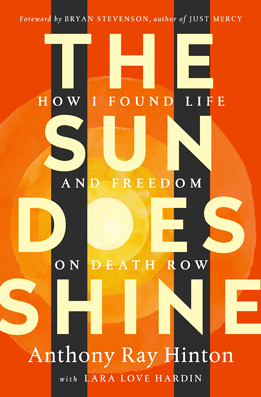 The Sun Does Shine could be the most impressive book you’ll lay eyes on.